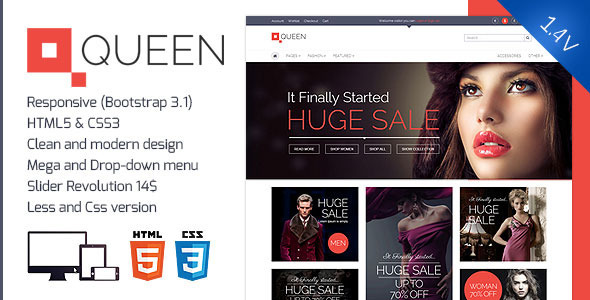 Queen is a modern and clean e-commerce template. It’s coded keeping in mind most of widely used e-commerce platforms. The template consists of 14 pages. The HTML structure is based on Twitter’s Bootstrap 3.1 framework. For styling we used LESS preprocessor – the latest web technology for creating dynamic CSS. It really helps end-users to save hours of coding. The package contains 2 versions of this template – one with LESS technology, and the other with regular CSS. We highly recommend to use the one with LESS. The template is easily customizable. You can create your own color scheme just by modifying one file. There is no need to dig through all the files anymore. – All images used in preview files are removed from the download package.